Manufacturers and wholesale distributors want to realize the full benefits of operating in the cloud enterprise resource planning (ERP) arena as early as possible and for less cost. However, despite acknowledging the limitations their existing systems present, these risk-averse companies report to Frost & Sullivan that they are cautious about implementing cloud ERP and adjusting to changes. Frost & Sullivan agrees that a proven solution with new service offerings from ERP vendors that can simplify the implementation process and optimize cloud ERP software is a major industry need. 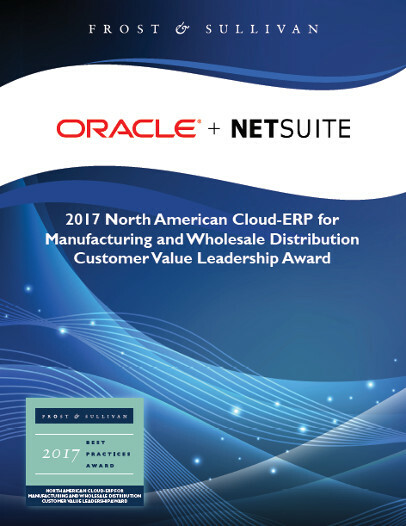 Download the report by Frost & Sullivan to see why NetSuite was awarded the 2017 North American Cloud-ERP for Manufacturing and Wholesale Distribution Customer Value Leadership Award.